Every so often it's important to revisit your current print management solution to see if it's still working for you. What might have been a welcome improvement five or ten years ago might no longer be effective as your print environment and your workplace have continuously evolved. In fact, there's even a chance your print management solution could be negatively impacting your organization's morale and efficiency—and ultimately its bottom line. To better evaluate any enterprise print management solution, it helps to match its performance against a set of criteria. So what follows is a brief print management checklist in the form of questions that you can ask to see if your current solution is still performing as intended, and to determine if it is able to meet your organization's existing and anticipated needs. How much printing downtime are you experiencing? This might be the most basic metric of any enterprise print management solution. If printing is regularly held up by server crashes, spooler hangs or rogue drivers—and the difficulty in troubleshooting those instabilities—something needs to change. Through its centralized management, driver conflict prevention and inherent robustness, PrinterLogic delivers the stability necessary to ensure uninterrupted printing. 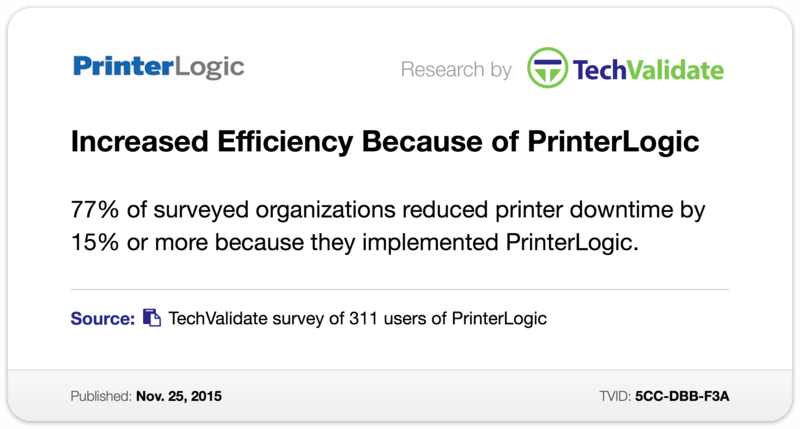 The independent research firm TechValidate reported that 77% of surveyed customers were able to reduce printing downtime by 15% or more by implementing PrinterLogic (TVID: 5CC-DBB-F3A). Is your print management solution future-proof? Traditional print management solutions are still running on a model that was introduced more than two decades ago. Without dozens of supplemental solutions and custom tweaks, this model is unable to adapt to the increasing need for mobile printing, secure printing or enterprise-wide print reporting/auditing in modern workplaces. PrinterLogic offers optional modules for Pull Printing and Mobile Printing that you can add at any time. These will seamlessly integrate with your existing print environment and provide your organization with powerful, easy-to-use functionality when it comes to features like release printing or BYOD and guest printing. What kind of infrastructure is required? All enterprise print management solutions have infrastructure requirements. The more fundamental question is whether that infrastructure is necessary. For example, distributed organizations often place one or more print servers in each remote location, driving up costs associated with maintenance, print management and hardware. Yet it's possible to retain all your existing printing functionality—and more—without resorting to a single print server. PrinterLogic's next-generation print management solution can eliminate print servers outright while providing centralized management, full-featured printing and greater ease of use with only minimal footprint requirements. What do your users have to say? This is an often overlooked evaluation tool but a hugely important one, as printing is an essential function of any workplace. When users are unable to print where and when they need to on account of printing downtime or convoluted install procedures, it can be detrimental to morale, creating an "Us versus Them" mindset between users and tech support. End users can actually be your biggest asset when it comes to print management – as long as they're empowered with the right software. PrinterLogic features a self-service portal that enables end users to locate and install nearby printers (even in virtual environments) with a single click. How scalable is it? A number of enterprise print management solutions bill themselves as scalable, but accommodating a growing user base by simply throwing more infrastructure and resources into an existing solution isn't exactly ideal. PrinterLogic is able to scale almost infinitely without a corresponding increase in hardware. By using proven direct IP printing technology in combination with a superior print management paradigm, admins can easily deploy printers precisely to new departments or users without resorting to group policy objects (GPOs) or scripts and can continue to manage printing organization-wide from a single pane of glass. This print management checklist is by no means exhaustive and will have to be adapted to your organization's unique conditions and priorities. But it should help you identify key performance aspects of your enterprise print management solution and determine whether or not it's time to migrate to one that is more stable, more scalable, more future proof, more cost-effective and more capable.